I'd like to start this post with a brief video, which in my mind sums up male friendship. Simple, uncomplicated. (BBFC advisory note: the following video contains 1 level 4 swear and 1 level 1 swear and a mild drug reference). My wife and I don't have a huge circle of close friends, probably one hands worth, and we don't head out socialising every night (an evening of Match of the Day and a quiet chat on a Saturday night in my mate's bedsit/shop is as boisterous as my social life gets). I often wonder how this will reflect on L, because recently he has demonstrated some issues with self-esteem and I wonder whether friends may be the answer. Isolation is a typical trait of our ASD kids, but L does not demonstrate this in his social life. Yes, he is very happy in his own company and by no means does he crave social attention to bolster his own self-view, which certainly does seem typical, but he does have a group of friends at school with whom he is very close and enjoys spending time. The problem in L's case is not a lack of friends, but what he does with them. He has a very high set of moral standards (see previous discussions regarding The Rules) and he applies these to everyone he is with. An example would be if one of his friends was having an argument with someone which was nothing to do with him, he is still compelled to rush in and help to protect his friend, often using a disproportionate response in order to ensure his friend gets his protection, even though unsolicited. This has become an issue at school where his behavioural standards struggle to match his moral ones. He still seems unable to balance his response accordingly when he, or someone else, is threatened, instead just going full bore into a fight, or a push or shove, or scratch. This was raised at a recent meeting at the school where they suggested L needs to learn when his friends fights are not his. A social story on this matter may help we felt so we are looking into that at the moment. How much do they need to know about 'Autism'? Will there be pressure on them to be more mature or responsible than they are? Does sharing L's condition with his friends set him up for potential bullying in the future? What will their parents think about their child having this responsibility? These are all questions we will work through with the school and the Autism Outreach Team who are now involved in supporting L an the school directly, but it is an interesting point in the process of dealing with L's condition. So, does the lack of a social life on my and my wife's part have any effect on this, perhaps giving him a general lack of experience as to how adults deal with social relationships? No, I don't think it does. And a brief word on best friends - my wife most definitely is my best friend, and I hers, which is wonderful (Sorry to Al, Matt, Phil, Gav and Ben who have all vied for this coveted position at various points throughout my life). "Scaramouche, Scaramouche. Will you do the Fandango?" A wonderful friendly term which I assume refers to his friendship with the aforementioned 'Scaramouche' and asking them to dance along with him. And I will leave you with a picture of L which I think sums up where he is at. This picture was taken following a brief sledging expedition. 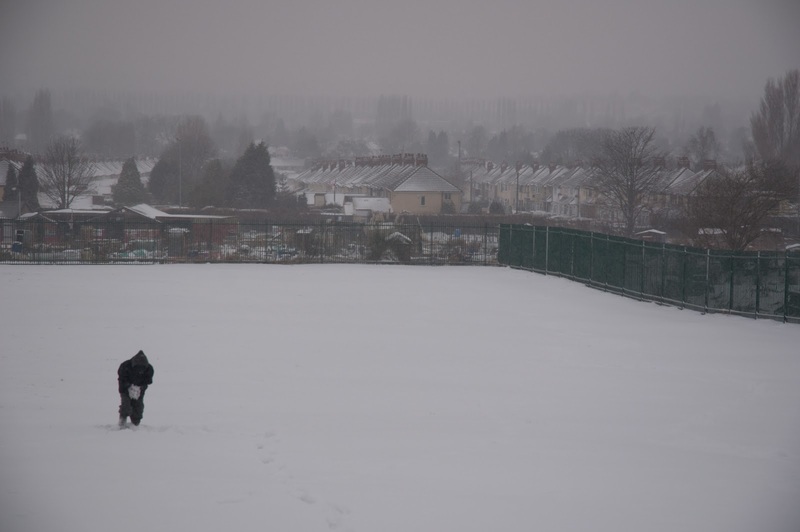 His sledge went rather quickly towards a concrete block and whilst he was stopped in time and unhurt, he still felt that it was unfair and stormed off across the field. 10 paces later, his mood was sated and he simply started playing on his own. If he can learn to do this at school, then maybe he can at least take himself away from quickly escalating situations and control his aggressive tendencies? Oh, I've just realised, the song 'You're My Best Friend' by Queen would have been a much better reference earlier. Let's just pretend that's what I said, rather than me having to go through the hassle of going back and editing it. Just between you and me. OK? Thanks.